Catarina is a Patchbay test app, created while the PatchCanvas module was being developed. It allows the user to experiment with the patchbay, without using ALSA, JACK or LADISH. You can save & load patchbay configurations too. The 'File' menu and 'Project' toolbar provides actions related to projects: the common new, open and save. The 'Patchbay' menu and toolbar allows you to control what's inside the canvas. You can add/remove groups, add/remove ports and manage connections. The 'Canvas' menu and toolbar gives you control over the canvas zoom. The menu has actions for printing and saving an image of the current canvas. 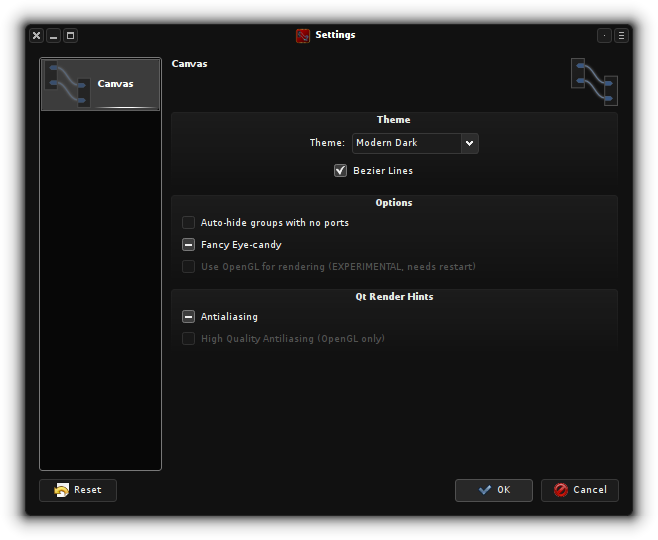 As with all the Cadence tools, you can hide the toolbar via 'Settings' menu, and also configure Catarina. You can change the theme used for the canvas (more on that below) and wherever or not to use bezier lines (will use straight lines if off). (Note: Full eye-candy currently is EXPERIMENTAL, and will make Catarina crash at random times. The cause of the crashes are under investigation). You can also enable OpenGL for the canvas (so the entire 2D space is rendered in the GPU, which makes big projects render much faster) and Anti-aliasing. OpenGL is experimental within Qt4 itself, and will not work properly on all systems. Settings will be applied as soon as you press 'OK', no need to restart Catarina. Catarina is available in the KXStudio repositories and ArchLinux AUR ('catarina' package in the KXStudio repositories, 'cadence' in AUR). 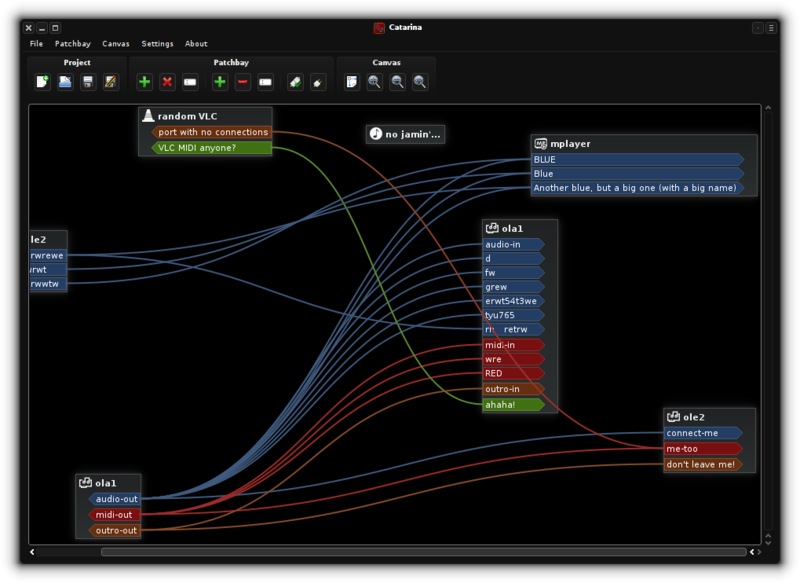 Pre-compiled binaries are available for Linux and Windows (part of the Cadence bundle). The latest source code is hosted on github, together with bug reports, feature requests, etc.